Parvez Sharma is now a 2018 Guggenheim fellow !! Please do visit our one-stop (designed from scratch) website at parvezsharma.com ! And yes, A Sinner in Mecca, the NYT' Critics Pick Film and later (very dissimilar book) book with the same title, and the film A Jihad for Love are still changing minds globally!! Our Islam Trilogy is all about truth-telling in the age of Donald Trump! And is stored for posterity in the prestigious UCLA Film and Television Archive. For a gay filmmaker, filming in Saudi Arabia presents two serious challenges: filming is forbidden in the country and homosexuality is punishable by death. For filmmaker Parvez Sharma, however, these were risks he had to assume as he embarked on his Hajj pilgrimage, a journey considered the greatest accomplishment and aspiration within Islam, his religion. He brings back the story of the religion like it has never been told before, having endured the biggest Jihad there is: the struggle with the self. ❯ BRING US TO YOUR CAMPUS/COMMUNITY NOW! WATCH ON ITUNES, NETFLIX, OR AMAZON! THE NEW YORK TIMES CRITICS' PICK! 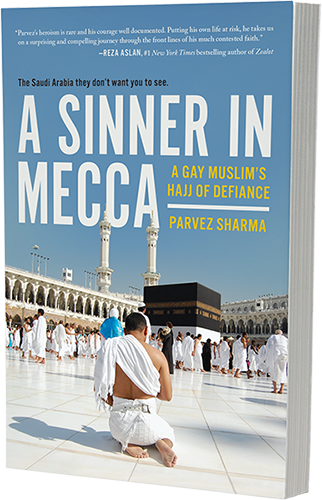 A Sinner in Mecca, the book is here! Truth-telling and going way beyond the [NY Times Critics' Pick] film! "Written with a deep knowledge of Islamic history with courage and fierce emotion"
"(Helps us) gain perspective on extremists and religion, but also acts as a glass to view the world here in the United States, the challenges felt by the Muslim community, and the oppressive weight of the Trump administration"
This book takes us from Beirut to Cairo to Mecca to Karachi, Kuala Lumpur and more--from Stephen Bannon to ISIS, from Obama to Osama. No one is talking about Islam from this perspective. Almost two decades of work in the trenches and boy, what a journey! # 1 NY Times bestselling author and CNN host Reza Aslan says" "Parvez's heroism is rare and his courage, well-documented. Putting his own life at risk, he takes us on a surprising and compelling journey through the frontlines of his much contested faith. A brilliant follow up to his films, "A Jihad for Love" and "A Sinner in Mecca". Foreword Reviews says: "Intimate and careful...shocking in its clarity and candor"
CLICK ON YOUR FAVE VENDOR BELOW TO GET THE BOOK(s)! Please visit our brand new website at parvezsharma.com ! Parvez Sharma is a 2018 Guggenheim Fellow! On parvezsharma.com you will find all the latest on Parvez’s work and his recent Guggenheim fellowship! 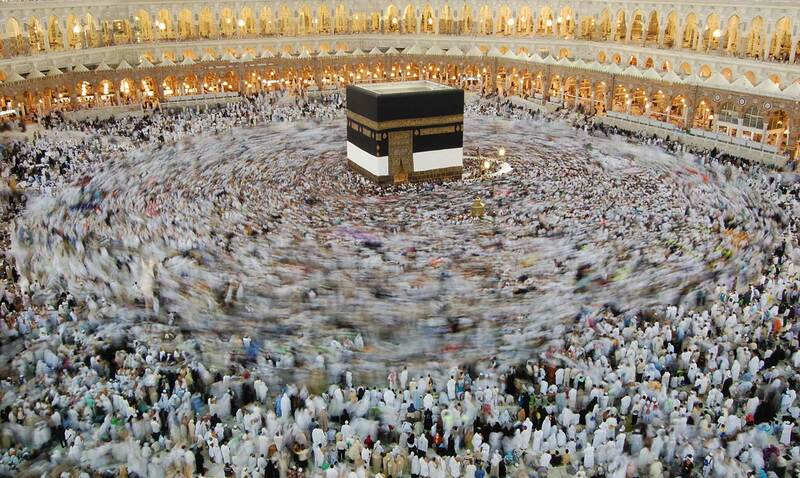 This ancient cube shaped structure called the Kaaba is the beating heart of Islam. The Kaaba also lies at the heart of A SINNER IN MECCA. It is contained within the Masjid al Haram (The Sacred Mosque) in Makkah (present day Mecca). This is why we call ourselves Haram [sacred; sanctuary] Films and this is why we are proud to present this remarkable film that takes you to the very heart of Islam in Saudi Arabia. The primary image in this slideshow represents the Tawaaf (circumambulation) of the Kaaba, done seven times, counter-clockwise. This circling has not stopped for more than fourteen centuries and is a ritual, which is central to the Hajj pilgrimage depicted in this film and forthcoming book. Please check out our designed from scratch, remarkable new website, a one-shop stop at parvezsharma.com . You will LOVE IT ! !